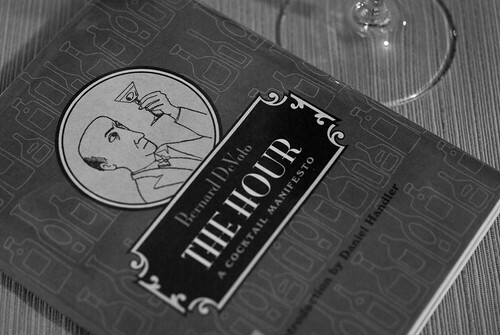 The Hour: A Cocktail Manifesto is one of the most satisfyingly curmudgeonly pieces of writing I’ve stumbled across in some time. Published by Bernard DeVoto in 1948 and reissued with a fabulous introduction by Dan Handler (known to most of us as Lemony Snicket), it contrives to sing the praises of alcohol while completely disparaging most of the people who drink it. The basis of DeVoto’s argument is that there are only two acceptable cocktails: a slug of whiskey and a martini. The martini must be composed of gin and dry vermouth, must be ice cold, and may contain a sliver of lemon rind but absolutely nothing else. Like Manhattans? Be informed that “whiskey and vermouth cannot meet as friends and the Manhattan is an offense against piety.” Like a Gibson now and then, or an olive in your martini? “…nothing can be done with people who put olives in martinis, presumably because in some desolate childhood hour someone refused them a dill pickle and so they go through life lusting for the taste of brine. Something can be done with people who put pickled onions in: strangulation seems best.” You don’t even want to know what he says about people who drink rum, let alone those who put fruit juice in it. The book is full of shamelessly vindictive commentary that you will feel the need to read out loud to the nearest person, whether they want you to or not. 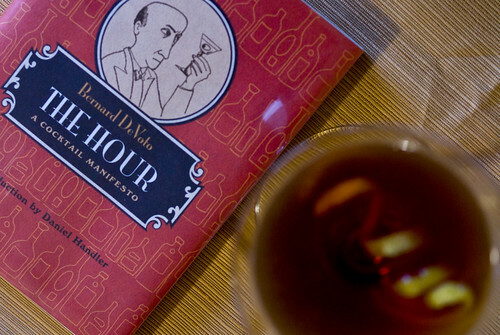 Necessary reading for anyone who enjoys a quiet drink at the end of the day. I wonder if this is something I could add to my current shop repertoire of smarminess… just to round the edges off.